The art of sewing has inspired me to create a new board on Pinterest. While looking for images and photos, I decided to research a bit further and speak to our tailor to find our more about the story of this craft. I’ve collected the main milestones in this post to share with you! – Sewing is considered one of the the oldest of the textile arts, dating back to the Palaeolithic era, and is used in a variety of industries such as tailoring, shoemaking, upholstery or sail making. – It was done by hand for thousand of years until the invention of the sewing machine during the Industrial Revolution in the nineteenth century. – In London the home of high-quality, bespoke tailoring is Savile Row. The first tailoring shops were established here in the late 18th century, and patrons have included Lord Nelson, Winston Churchill and Mick Jagger. – Tailors use a pattern or template to construct pieces of garments, before sewing them together to create the finished product. – During the 20th century, there were a number of advances in the sewing machine technology and the textile industry that spread around the world. – Although Western-style clothing prevailed, different cultures have developed diverse sewing techniques, from methods of cutting fabric to types of stitch. I have also found many sewing tips, tools and tricks online for your home sewing, which I’ll share with you on our Pinterest sewing board. But remember! if you don’t have time to do repairs or simply don’t know how to sew, LaundryRepublic’s professional tailoring service offers a brilliantly convenient way to get your clothes repaired or altered. From sewing on new buttons, to re-seating and re-hemming, to taking a garment in, out, up or down – our excellent tailor has 30 years of experience and is here to help. Simply enter your instructions when ordering online or call us on 020 7193 3130 for specific queries. Our standard tailoring prices are available at www.laundryrepublic.com/view-prices.html, and for anything else you can send us the garment and ask for a free, no-obligation quote. A couple of weeks ago Ian Walker and David Lambert, the founders of LaundryRepublic, were invited to Accelerate 2013, a flagship event aimed at celebrating Britain’s business champions and their impact on the British economy. LaundryRepublic was named in the Accelerate 250, a group of the fastest growing businesses in the UK. David and Ian received inspirational advice from business luminaries including Lastminute.com founder Martha Lane Fox, Cobra Beer chairman Lord Bilimoria, General Sir Mike Jackson, former Chief of the General Staff, and Wikipedia founder Jimmy Wales. In his keynote speech to the conference, Jimmy singled out LaundryRepublic as an example of the future of online business, having joined our laundry revolution at his home in London! From the LR team thank you very much to all of our customers who are making our laundry revolution possible! Almost 350 of you completed our survey – thank you for a fantastic response! The results were fascinating, and you showed strong demand for a special gym kit service. We’ll be introducing this within the next couple of months – watch this space! In the meantime, we’re delighted to announce the winner of our prize draw: Nina Newbery, who uses LR at her gym near Regents Park. She wins £100 to spend on dry cleaning and laundry – congratulations Nina! We’ve added two new friends to the LR team! 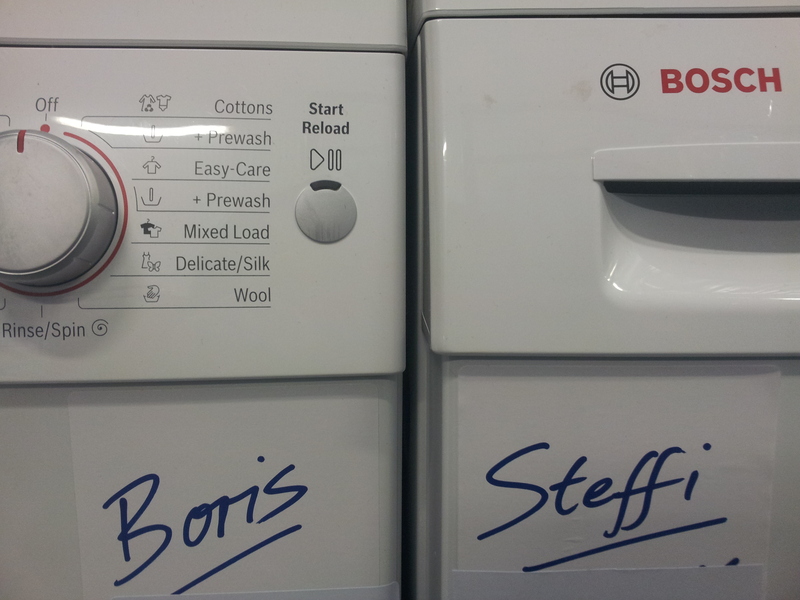 Let me introduce you to Boris and Steffi, our new Teutonic washing machine and dryer pairing. They are top of the range Bosch machines designed to produce very high quality results. They are also very energy and water efficient (A+++ for the washing machines), while producing excellent results at lower temperatures. They are part of a range of improvements we are carrying out to provide an even higher standard of care for our wonderful customers’ clothes. You may have also noticed that we are using a new detergent with better cleaning power, and have improved the way your clothes are packaged and returned to you. Our new parcel paper is thicker and better quality and ensures that your washed, dried and folded laundry comes back in a neat, nicely wrapped package finished off with our branded tape. Would you like to try our upgraded Washed, Dried, and Folded Laundry Service? We’re offering £5 off a standard load (up to 6kg) and £10 off a large load (6 – 12 kg) until July 6th. Simply enter the code LAUNDSW19 in the voucher code box when you place an order at LaundryRepublic.com. Dry your laundry faster and more efficiently! I’ve heard many times that adding a dry towel to a wet load in the dryer make your clothes dry faster. The idea is that the towel absorbs the moisture from the wet clothes reducing the drying time and energy usage. If you want to save time and energy and don’t have a clothesline (we don’t have much sun either! ), try the following tips to make your dryer work more efficiently. – Don’t overload the dryer. Smaller loads have more room to tumble freely, drying items quicker and preventing wrinkles. But don’t put only 2 -3 items, that will save you time drying but not energy! – If you have many clothes to dry, put several loads in the dryer consecutively; the dryer will be already warmed up and will save energy. – Separate large items from lightweight fabrics for faster and more efficient drying. Help to save energy by letting them air dry for a few hours before placing them in the dryer. – Clean the fluff filter after each load to make the dryer work more efficiently. I hope these tips are helpful! If you have any questions or know another tricks, please leave us a comment. And of course, if you want to save the chore of doing your laundry at home, we would be more than happy to wash, dry and fold it for you! Over three hundred of you have completed our survey on using LR at your gym – an amazing response rate! A huge thank you to all of you who have done this! We’ll be announcing the winner of the prize draw to win £100 to spend on your dry cleaning and laundry at LaundryRepublic in June’s newsletter. What water temperature should I use? Use hot water to wash linens and towels, white clothing and gym clothes (regardless of the colour). Hot water is best at removing heavy soil and grime from your clothing. However, it can make your clothes wrinkle and shrink, so don’t use it with coloured clothes as they could fade! Most people use warm water for their laundry. It doesn’t have the power of hot water to remove heavy stains, but cleans well and reduces the possibility of fading, wrinkling and shrinking. It is good for most washable fabrics (nylon, polyester, rayon). Cold water is good to clean dark and bright coloured clothes, and delicate items. It prevents your clothes from fading, but it’s less efficient for removing stains. If you have heavy stains, you should pre-treat them before washing, wash the load longer or even soaking the item for a few hours in cold water and detergent to ensure a better cleaning. If you don’t want to deal with your laundry chores, why don’t you try our Laundry Service? We’ll care for your clothes, washing, drying and folding everything nicely into a wrapped packaged for you! I have always thought that washing machines have a black hole inside that abducts socks, leaving behind their soul mates and leaving me with lots of lonely socks. I have been trying to look for handy ways to keep them together in the wash, but I have to admit that sometimes they find a way out! Safety pins are part of our daily work here at LaundryRepublic: we pin our laundry tags on garment care labels to keep track of the items throughout the cleaning process. So I have applied the same method for my socks. I keep a little box with good quality safety pins near a smaller and separate laundry basket where I put only dirty socks (to avoid losing them before even washing! ), and pin each pair of socks together at the ankles. Once they come out from the dryer, I keep them in the drawer with the safety pin, until I put them on again and I just put the safety pins back in the box! Good quality safety pins don’t rust and it’s a very simple and efficient way to not lose any socks. Instead of safety pins, you could use binder clips or rubber bands, which can be very handy before you separate the pair of socks by colour to identify which socks belongs where. I have also found something called sock rings: little plastic rings with teeth in them to put your socks in and hold them together. However, those are a bit more expensive, and easier to get lost. Even when you try hard, some couples are simply not meant to be together. So I have pulled together the ideas of some very creative people who have created an orphanage for lonely socks. Check out our new board on Pinterest for these inspiring ideas. They will look great in the laundry room! We’ll be closed on Monday, May 6th for the bank holiday, and will not be making any collections or deliveries on this day. You will still be able to place an order as normal around the bank holiday, but please add a day to the expected turnaround time. At LR we like to ask our customers for their opinions: whether it’s feedback on your most recent order, or whether what additional services you would like us to provide.